It’s been a very scary few days for those who live in Central Queensland with the arrival of Tropical Cyclone (TC) Marcia. While the cyclone was hitting the coast, here in Brisbane we were experiencing lots of rain from another weather effect and then as TC Marcia was downgraded and travelled down the coast we had even more rain yesterday. It’s been a great couple of days for knitting and spinning and I’ve done both. Today the sun has come out so I’ve managed to take some photos of three completed projects. I bought two of these rovings a while ago and have had the spun skeins sitting in my stash for a while now. So I thought I’d make another One Row Handspun Scarf as it’s an easy pattern and I’m planning on taking the scarf to New Zealand in April. Hopefully, I’ll get to wear it quite a bit. 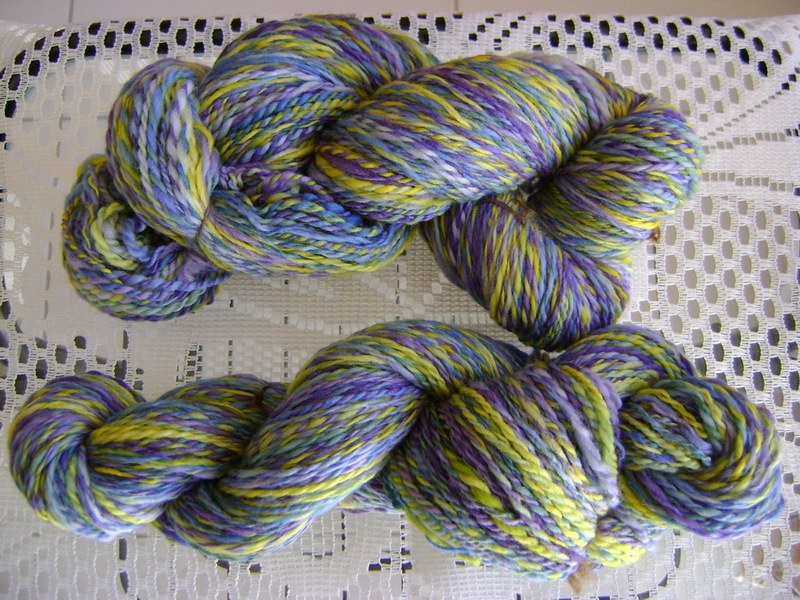 The spun yarn came out a treat and I love all the colour changes. I think the scarf looks fantastic! 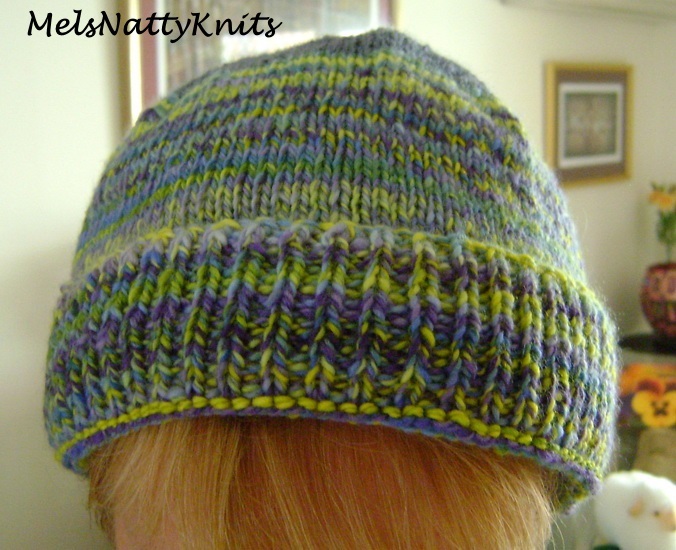 I used size 5mm needles as the yarn lends itself to roughly a 10ply yarn. As with my previous One Row Handspun Scarf, I added the tassels. There’s eleven on each end and each tassel contains 5 x 10 inch lengths of yarn doubled over. 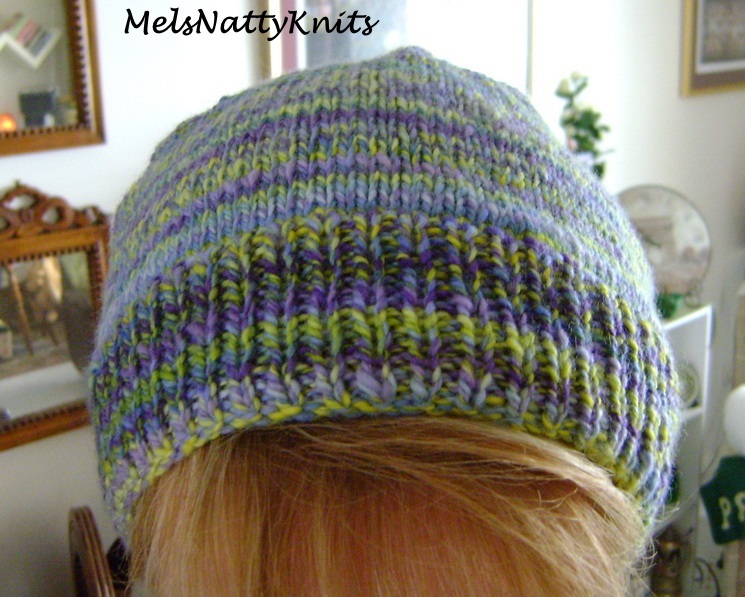 With the leftover yarn I decided to make a hat. I had no idea whether I’d have enough yarn so I just started on this pattern which is distributed by Bendigo Woollen Mills. 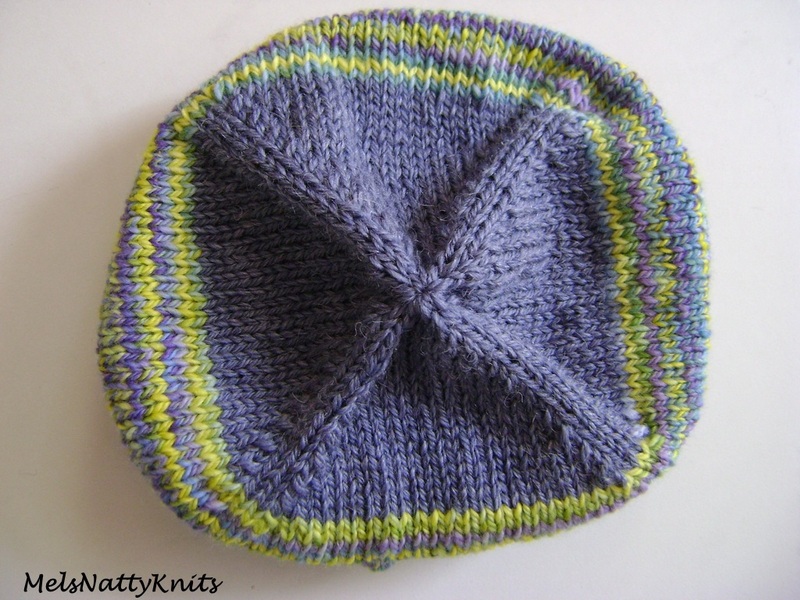 As it’s a bit of a slouchy hat, I can fold the brim up to make it a snugger fit. 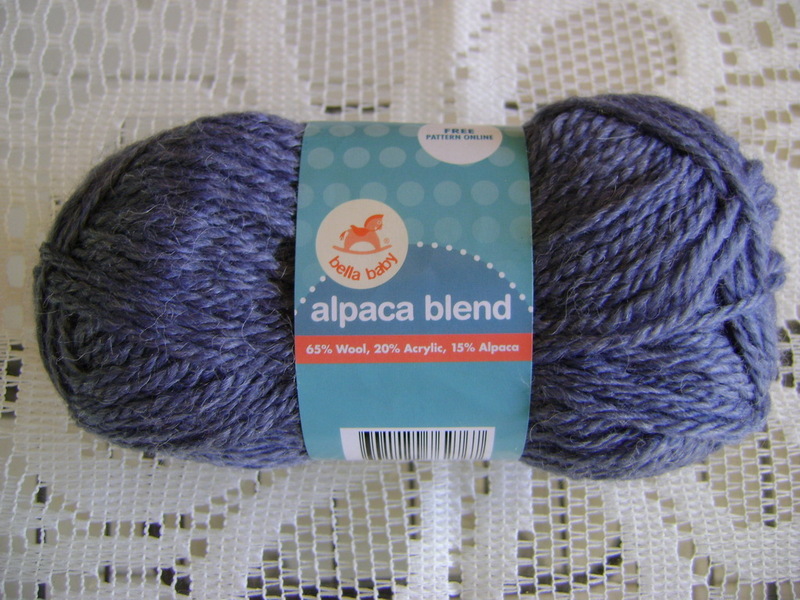 As you can see I did run out of yarn but was lucky enough to find this Bella Baby Alpaca Blend yarn in my stash. A cute little hat even if I say so myself. I love the decreasing effect too. 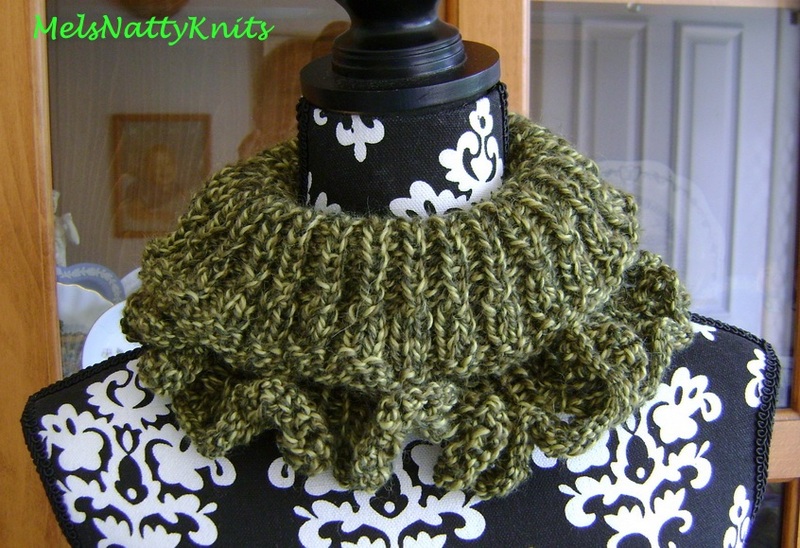 And just to finish off, I made this Ruffles Cowl a while ago. 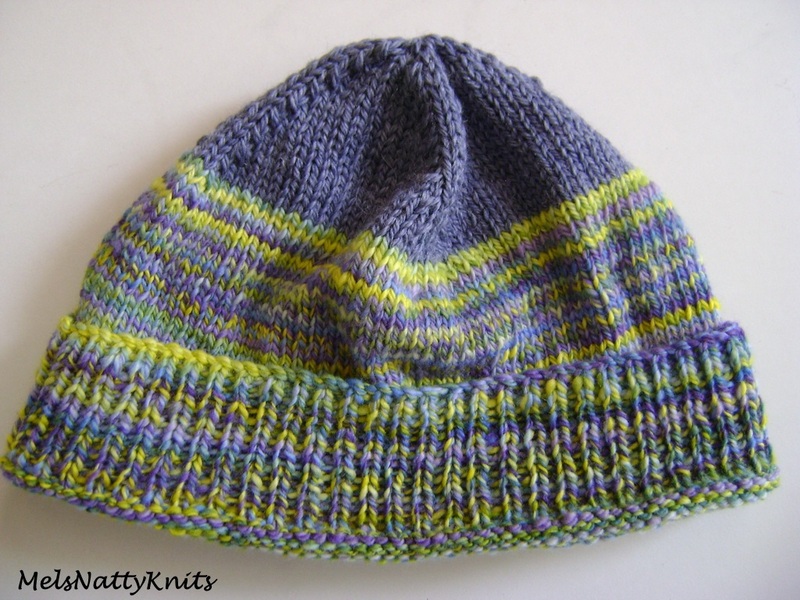 It’s a very quick knit. I can see me wearing this cowl when cruising around Milford Sound in New Zealand as that will probably be one of the coldest places I visit. 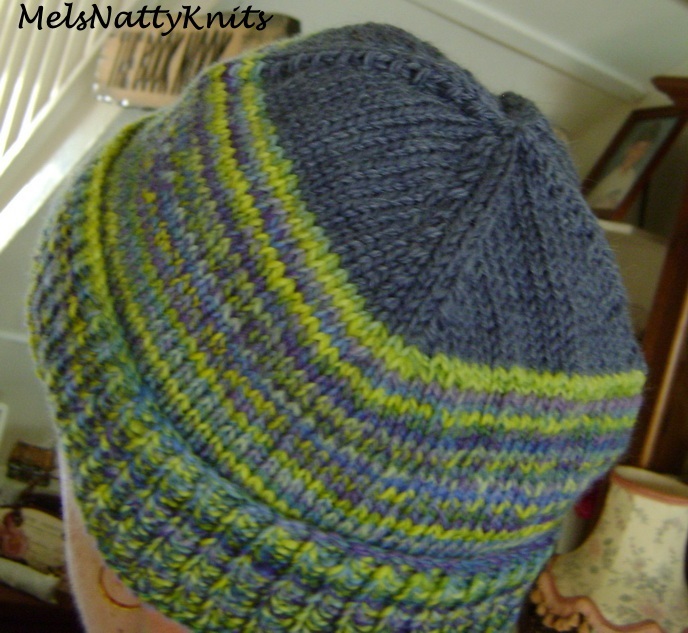 I made it with Sullivans Celtic which is a 10ply yarn. Here’s a sneaky peek at my latest lot of spinning that I started yesterday. 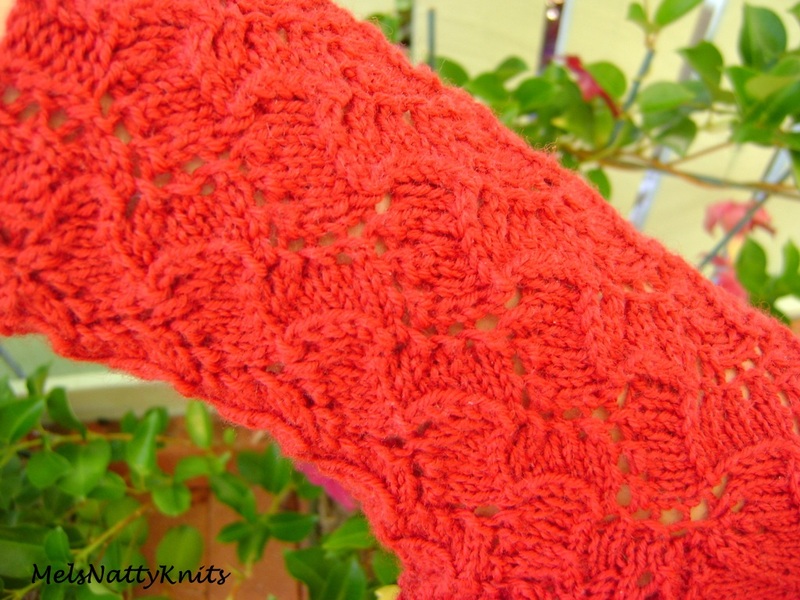 The colour is called ‘Outback’ and it’s one of the rovings I bought from Kathy’s Fibres. That’s all my news for now. I hope you’re all having a wonderful weekend filled with lots of fibre and yarn. 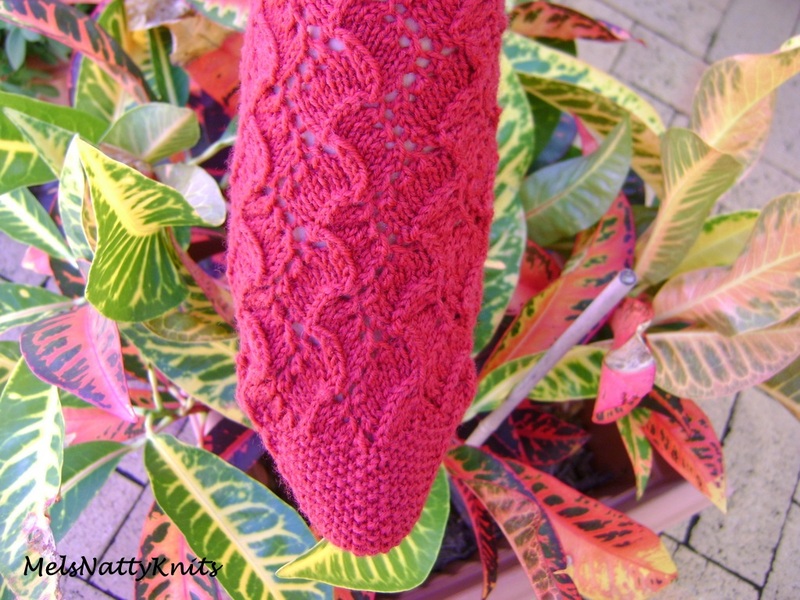 I actually had a similar coloured sock yarn in my stash to use. 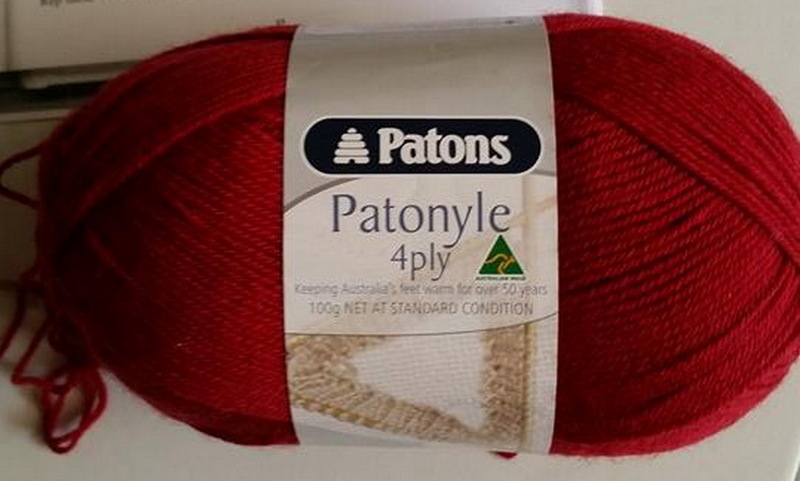 It’s Patons Patonyle and specifically made for socks. The socks came out a treat. You’ll have to excuse the colour variations in some of the photos which is due to the camera and taking photos outdoors I think. The heel is quite interesting too. 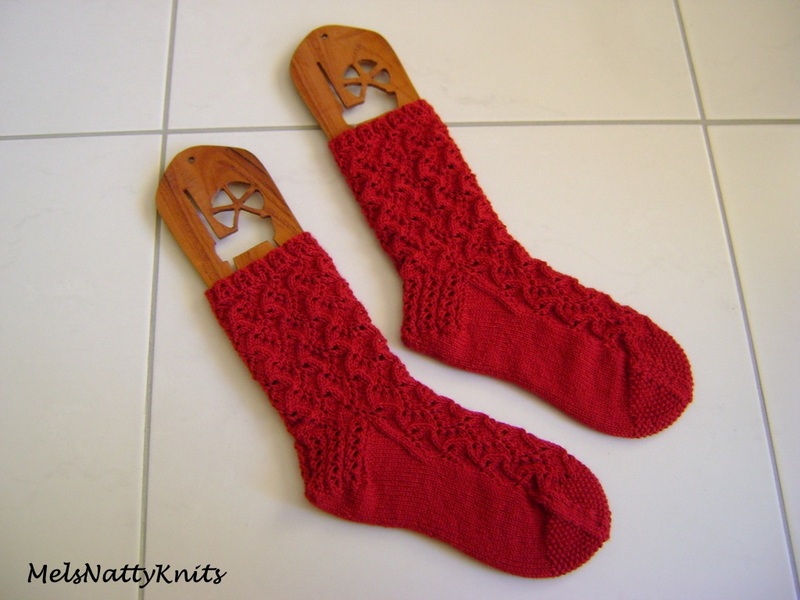 Not sure how long you could wear these socks before the heel might start annoying you though. But you’d have to admit, it is very pretty. The Lealt pattern is quite exquisite too. This is the true colour of the yarn. 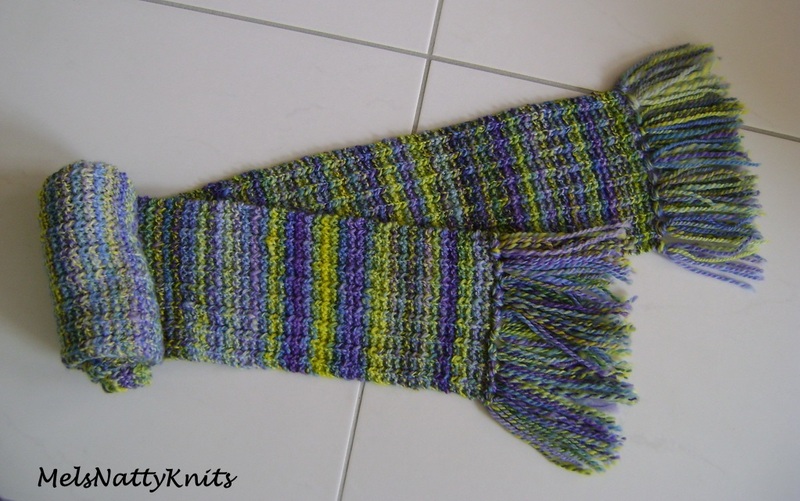 Which is not too far removed from the colour of the yarn used in the pattern. Now I just need to wait patiently for winter to arrive so I can wear them!! To finish off I’d love to show you some little gifts I received on my birthday which was Friday the 13th. 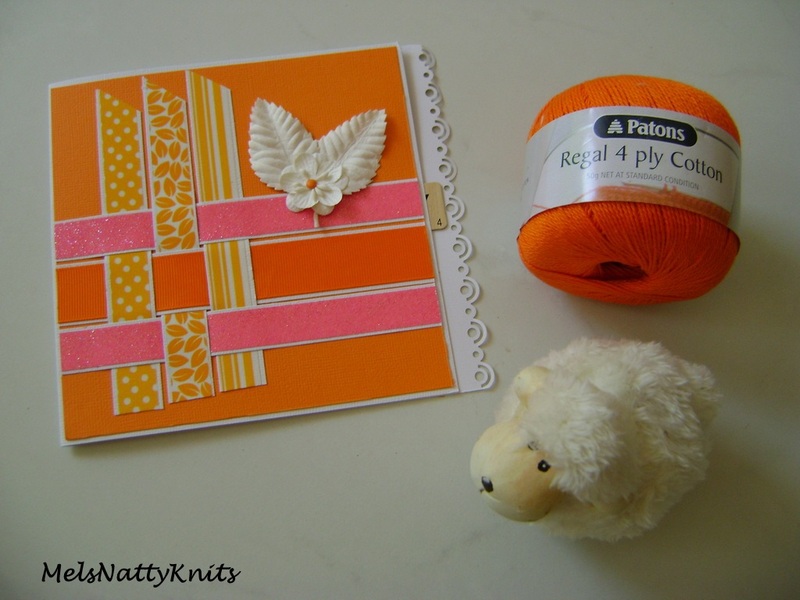 My friend Helen gave me this cute little sheep, a ball of bright orange 4ply cotton and she made the card too. And my friend Stephanie gave me a lovely fabric scarf with butterflies on it. 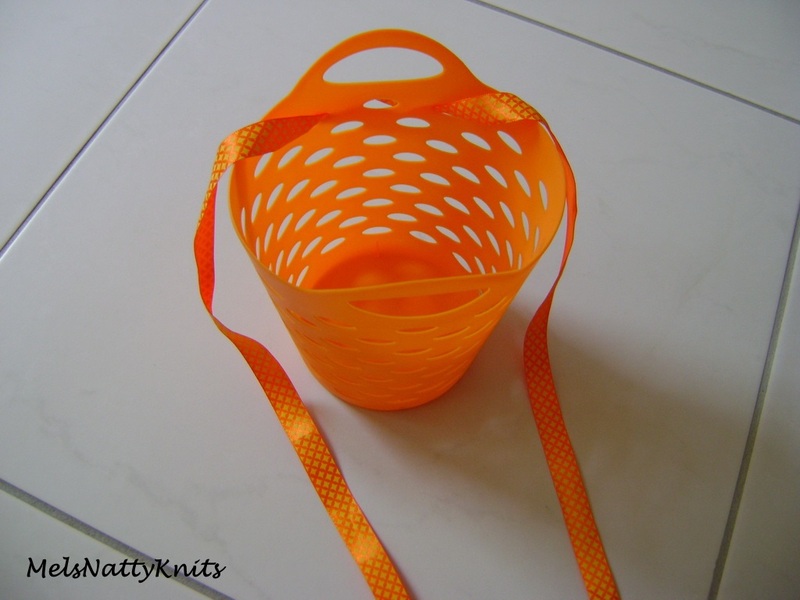 Rather than using wrapping paper she used this gorgeous little orange basket and tied it with some orange ribbon. So clever and now I have this little basket that I can use. I live in an area where there are no LYS (local yarn shops) except for Lincraft and Spotlight. 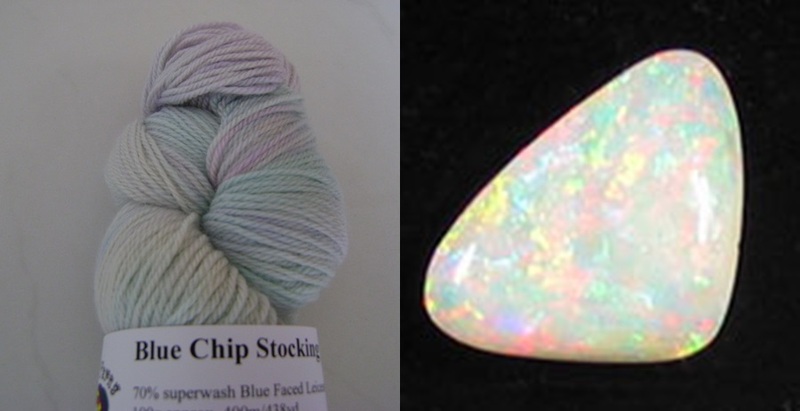 While both these shops carry a large range of yarn, they don’t carry much in the way of 4ply, 2ply or hand-dyed yarns. Over the last couple of years I’ve discovered quite a few fantastic Aussie artisan hand-dyers who produce the most gorgeous and delicious yarns plus the occasional ‘bricks and mortar’ shops in Brisbane. Shorn Fibers is an online shop operating from Minden in SE Queensland, Australia. Angela is an amazing artisan hand-dyer and for those of you who were at the Redlands Spinners & Weavers camp in September last year, you should remember Angela and the gorgeous array of yarns she displayed in her shop. Her prices are incredibly competitive as well. I have bought tons and tons of yarn from Angela. She knows my weakness for autumn shades and tends to dye exactly what I like. I can never resist purchasing a little bit more each time. I went crazy at camp last year!! 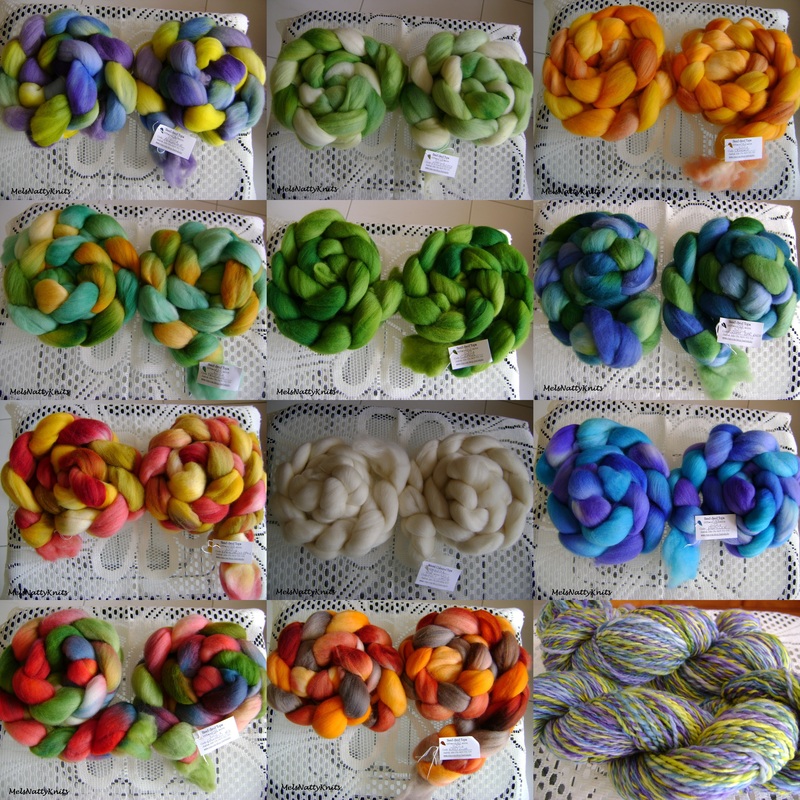 Here’s an array of just some of the yarn I’ve purchased from Shorn Fibers. Dyed By Hand Yarns is an online shop located in Melbourne, Australia. Julie Boydell has been open for business since June 2012 and has a fantastic array of gorgeous yarns in all plies and colours. 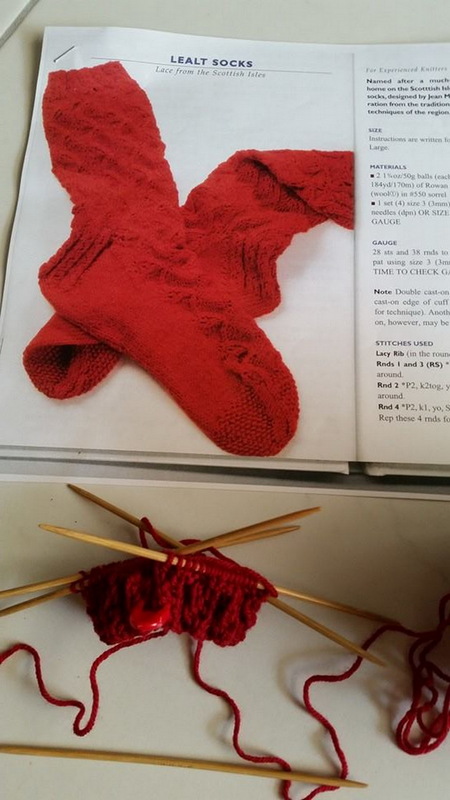 There is also a yearly Sock Yarn Club which you can join. The theme for 2015 is Wild About Wildflowers – colours inspired by native wildflowers of Australia. This is a six month sock yarn only club. 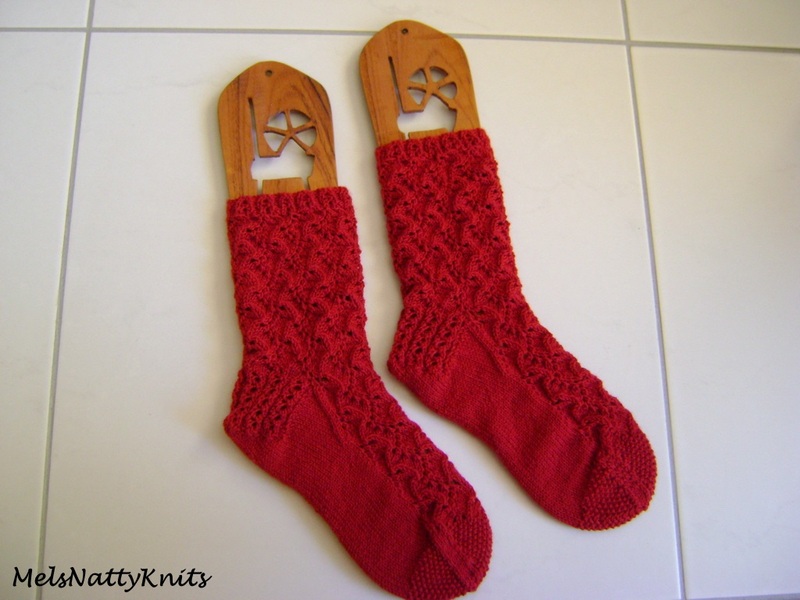 You will receive two skeins of sock yarn posted out in the last week in March, May and July. Yarns included will be one skein each of Tough Stocking, Mother’s Love, Big Blue Stocking, Silk Stocking, Blue Chip Stocking and introducing White Gum Wool 4ply. Each skein of yarn will be dyed in a colour inspired by an Australian native wildflower. These colours will be exclusive to yarn club members for 12 months. 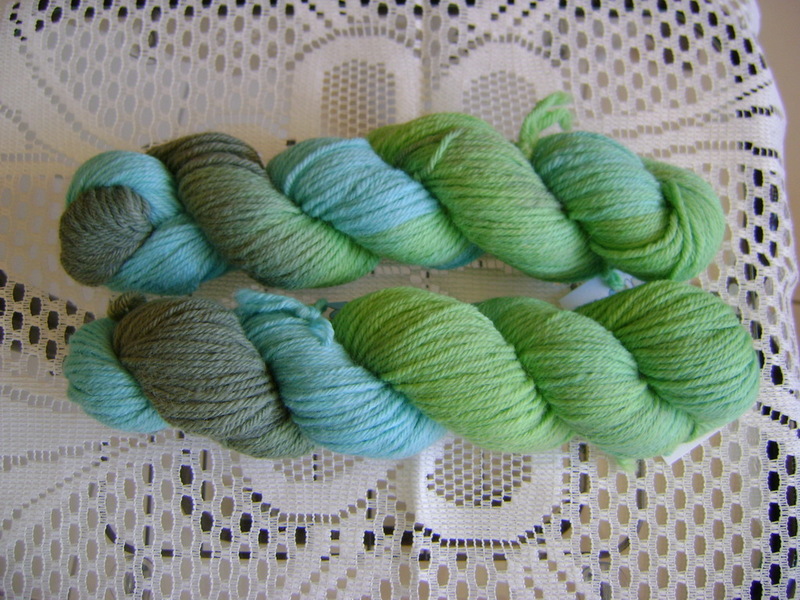 Custom dyeing of these colours may be ordered by yarn club members for the duration of the club. The cost is $165 plus postage. I have subscribed to the sock yarn club over the last two years and have picked up some stunning colourways. Aren’t they spectacular!! One of my other favourites from Dyed By Hand Yarns is this stunning Limelight colourway in Tough Stocking which I used to make these socks. Augustbird is an online shop located in the Adelaide Hills, South Australia. 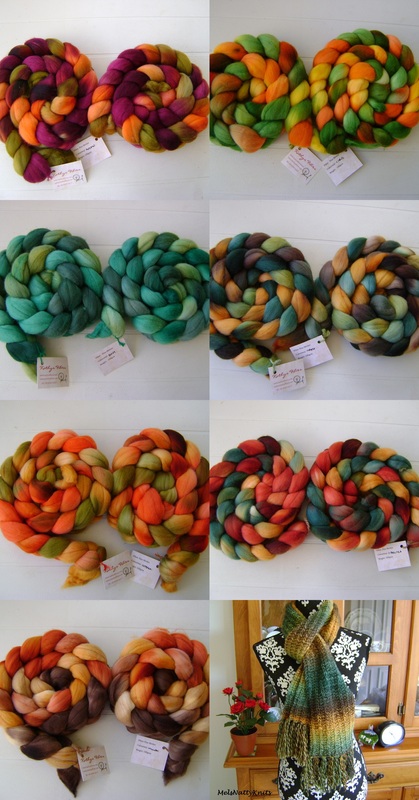 Rebecca Robinson produces some of the most exquisite colourways. 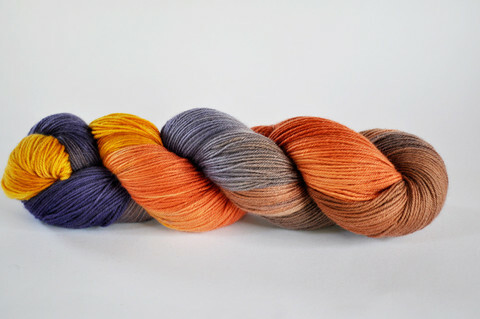 If you follow Augustbird on Facebook, Rebecca will usually post a message regarding the current month’s colourways. 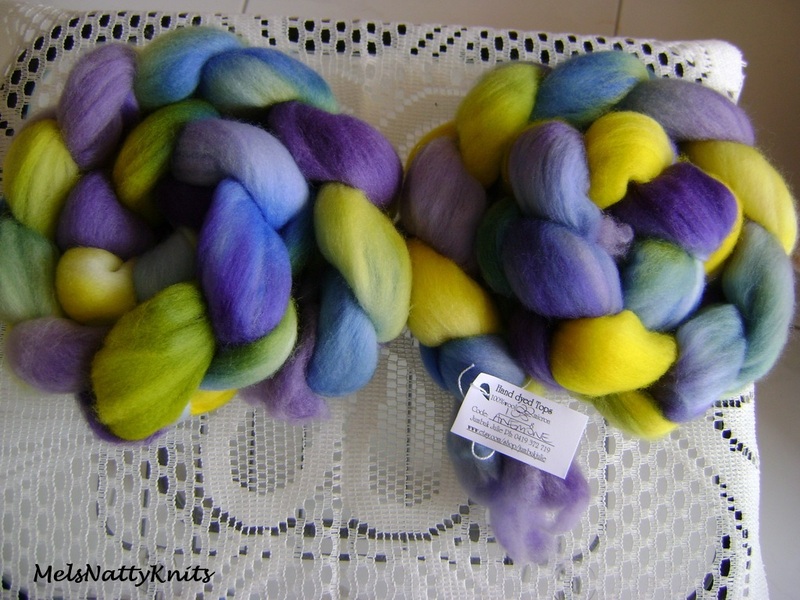 You have the opportunity to order the colours you prefer and they are hand-dyed on request. 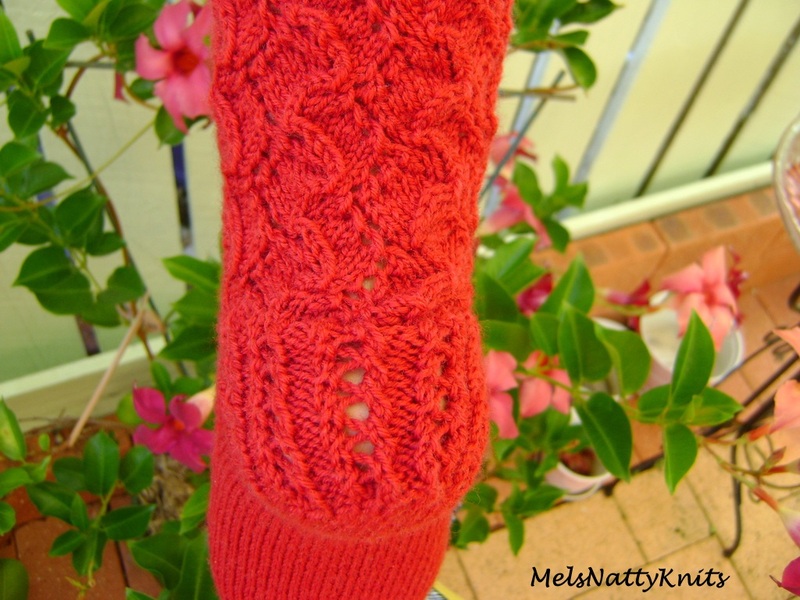 I recently completed a test sock knit for Rebecca and received a yarn voucher. 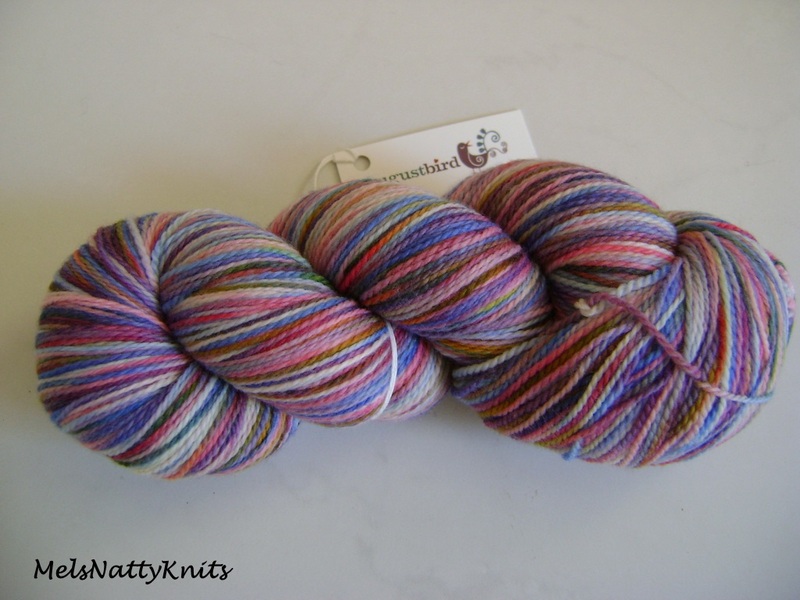 I purchased two skeins in a stunning colourway called Songbird which I have yet to knit up. I’m waiting for just the right pattern. 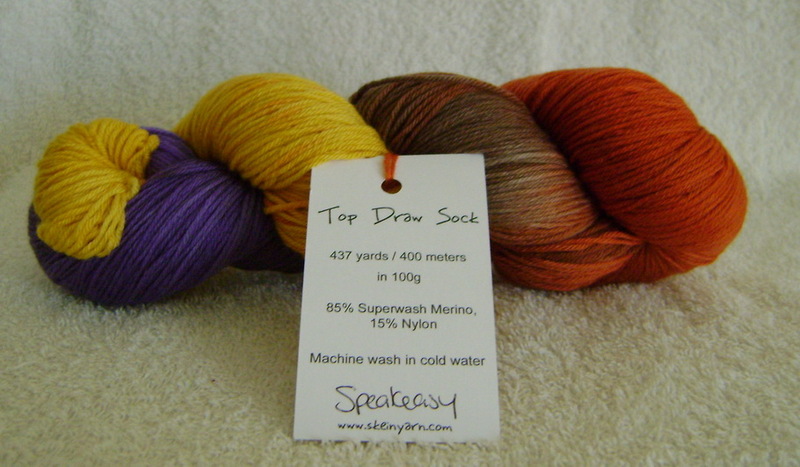 Skein is a small, independent hand-dyed yarn company based in Australia. 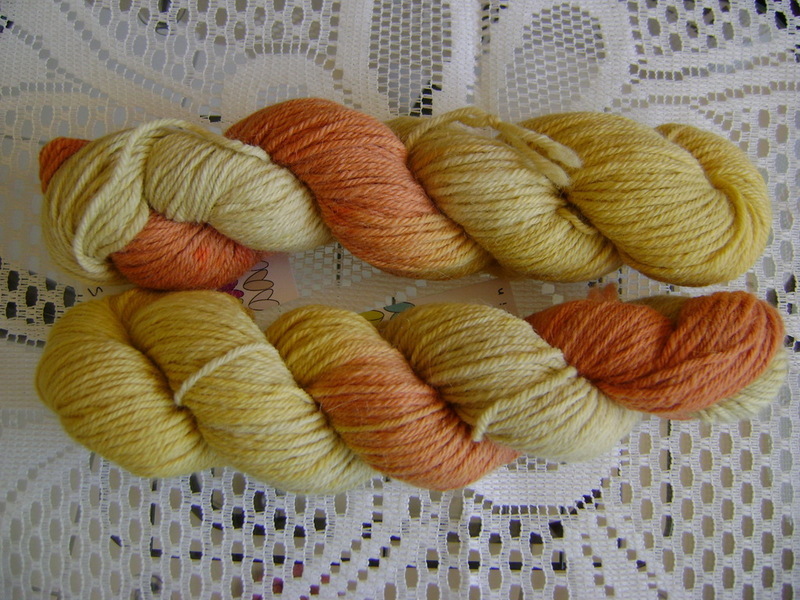 All Skein yarns and fibres are kettle dyed using professional acid-based dyes. These dyes are permanently set by the use of a vinegar mordant and heat. Once the dyes have been fully absorbed and the kettle water is clear, the yarns and fibre are removed, rinsed and washed with a light, phosphate-free wool wash, and then gently spun and hung out to dry under the Australian sun. I have purchased quite a bit of yarn from Skein too and found it to be of exceptional quality. The colourways that are offered are quite mind-blowing too. Now to a couple of fantastic online suppliers of wool rovings. Firstly, Kathy’s Fibres. Kathy has a wonderful range of hand-painted rovings at only $11 for 100g. The colour selection is stunning. 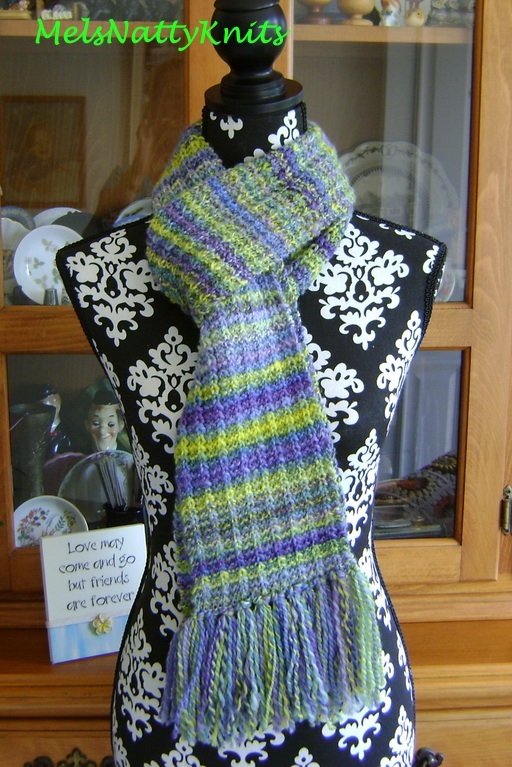 I have bought a few and have made a gorgeous scarf in the Forest colourway. 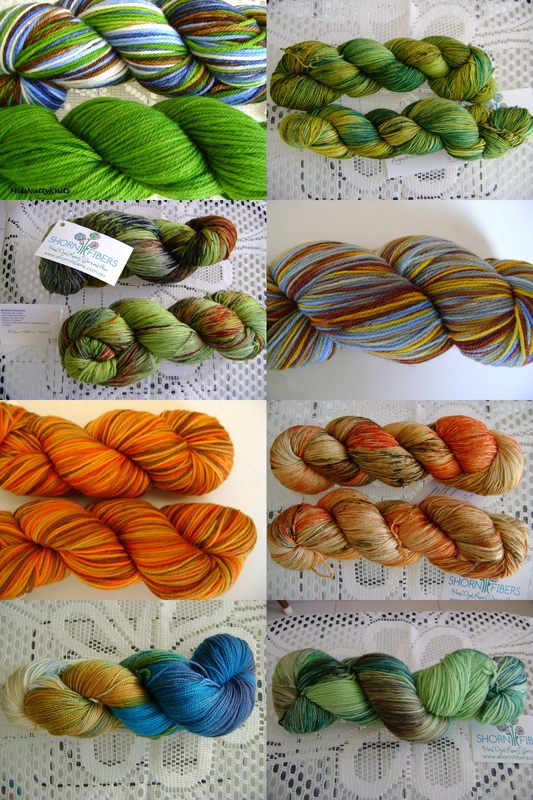 Jumbuck Julie also dyes some incredibly appealing colourways and her selection is mind-blowing. There is just so much to pick from! I just looked at her Etsy shop and there were 273 colourways available!!! They’re $11.50 each. These are some of the rovings I’ve purchased from Jumbuck Julie. I’m currently knitting a scarf in the Anemone colourway (top left and bottom right below). Now to some local Brisbane (and interstate) ‘bricks and mortar’ and online yarn shops. Yarn Glorious Yarn is situated at Suite 11/180 Moggill Road, Taringa (0438 374 364). You can also purchase online. Shop hours are Wednesday – Friday 10am – 3pm and Saturday 10am – 4pm. 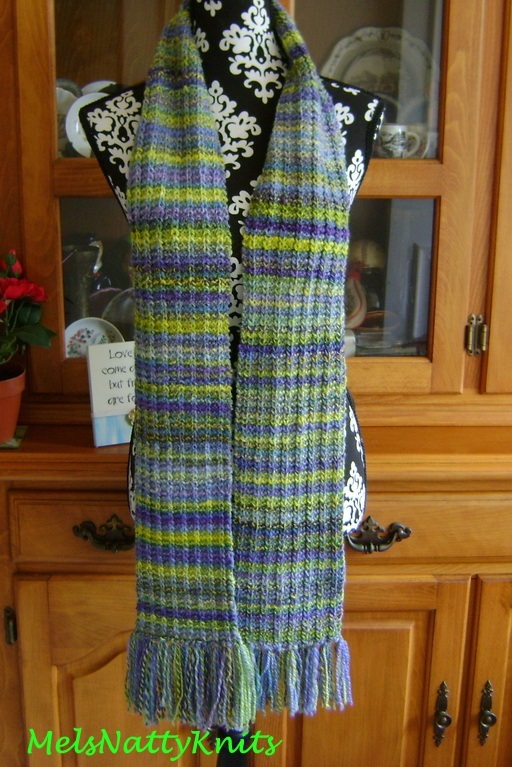 Sue Wheeler is the sole Aussie supplier of Zen Yarn Garden (ZYG) yarns which are made in Canada. 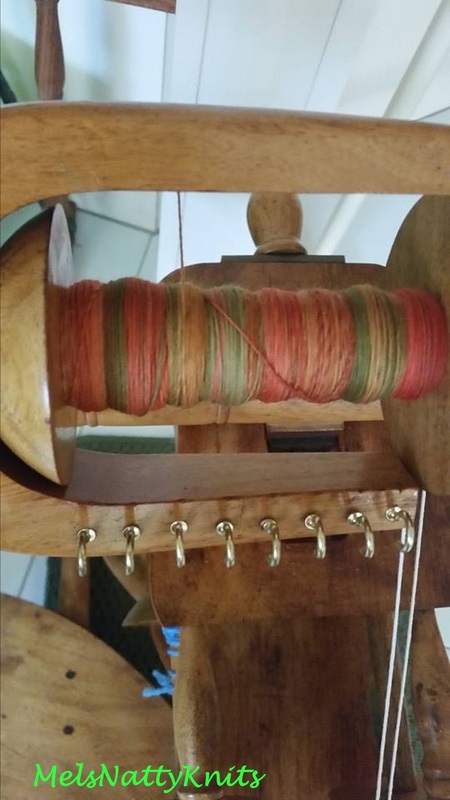 ZYG has been producing an ART Walk Series of yarn, the colours of which are based on famous paintings. 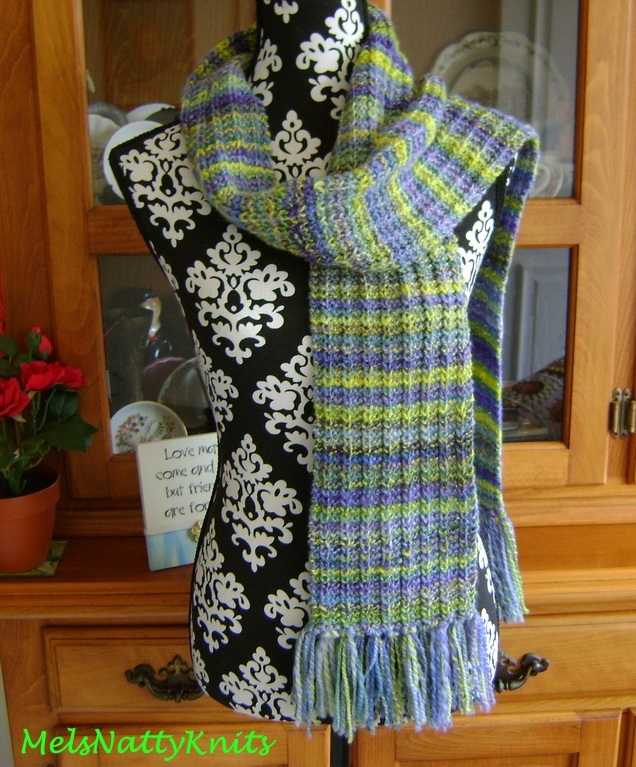 They are simply exquisite and I have purchased two skeins in each series. They’re currently up to Number 13 and can be found at Yarn Glorious Yarn. Cost per skein is generally between $32-$36 but well worth the value particularly when some of the yarn has a cashmere content. Sue does not charge for postage if you purchase over $50 worth of yarn, which is always the case with me! Sue also stocks many other brands of yarn. ZYG has just started another series called ‘Inspiration‘. Oh my goodness, the colours are gorgeous! Purlwise is an online store as well as a bricks and mortar shop located at 4 Comboyne Street, Kendall, NSW. Opening hours are 10am – 4pm Thursday – Sunday. Purlwise is run by Mark who has been knitting for over 20 years. (02) 6559 0202. All purchases over $50 do NOT incur any postage. You will also receive discounts for purchases over $100, $150, etc. 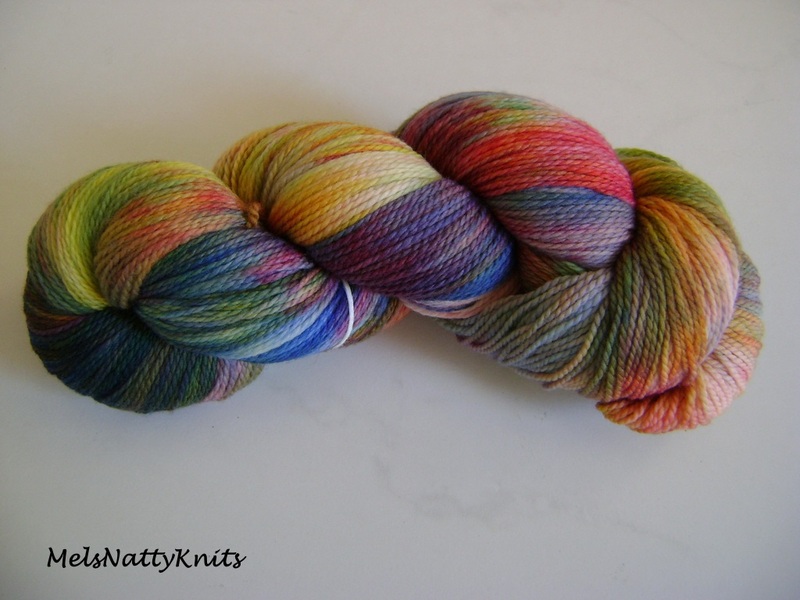 There is a huge range of yarn to select and some very bright and cheerful colourways too. Yay! 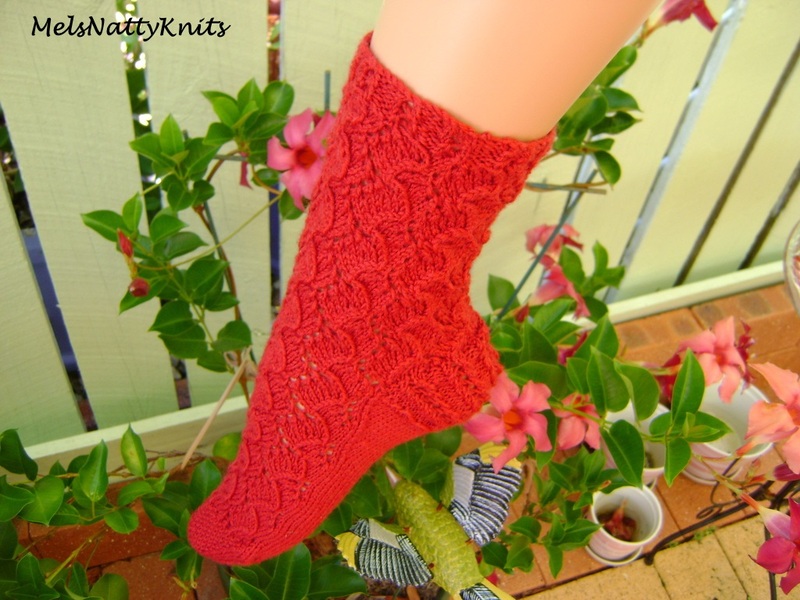 for Yarn is an online store operated from Brendale, north of Brisbane. 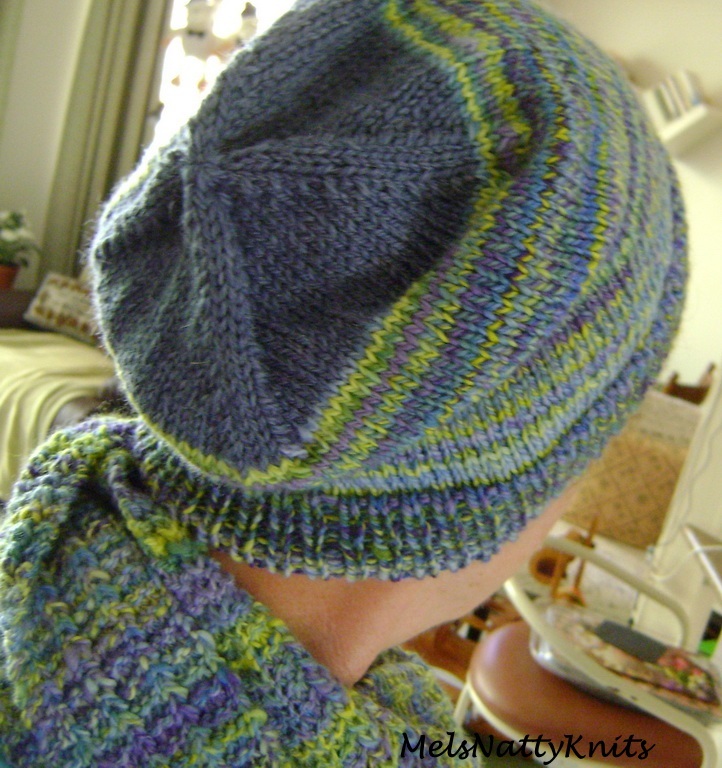 Kiri carries a huge range of yarn and always has yarn and patterns on her Clearance Items page which is worth a visit. Kiri was previously a high school art teacher but in mid 2008 she decided to take her yarn hobby to the next level which is when Yay! for Yarn was started. That should be enough to whet your appetite don’t you think? There are still more great yarn suppliers in Australia which I’ll cover in a future story. 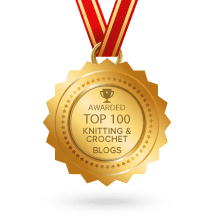 If I can give you one tip it is to make sure you subscribe to any online newsletters that are offered by these stores to ensure you’re always informed of sales and new yarns. It’s what I do and that’s probably why my stash is enormous! 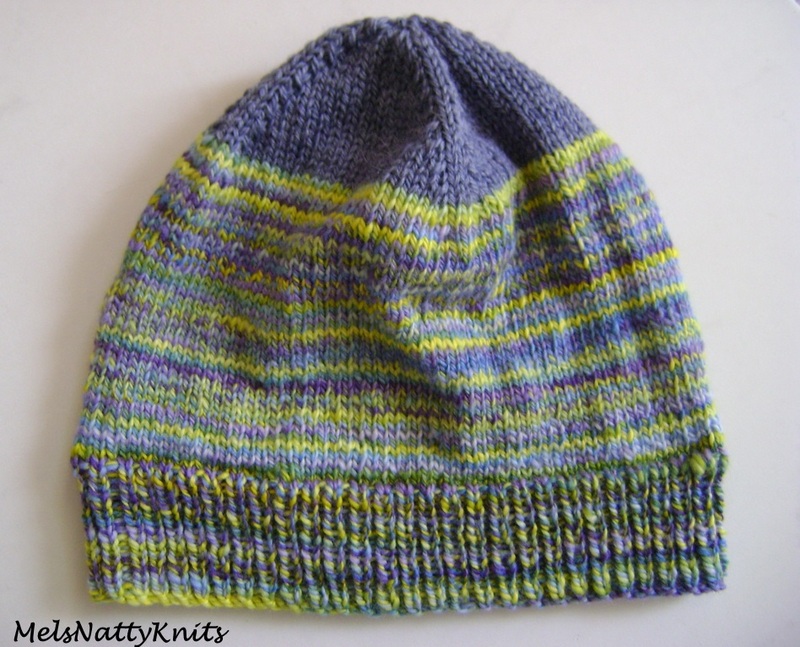 I would also recommend you ‘like’ their Facebook pages and join their Ravelry groups.